Vane Thermo-Anemometer is ideal for balancing air conditioning and heating ducts or checking the operation of fans and blowers. Measures air volume in cubic feet per minute. Built-in data logger. Thermo-Anemometer Test Instrument is a versatile dual function unit that quickly and easily measures air velocity or volumetric flow. Applications include duct traverses, HVAC inspections, and testing and balancing. 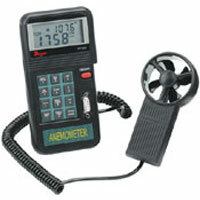 Differential Pressure Anemometer is robust and durable. No moving parts or sensing electronics. Applications include measuring face air velocity on grills, diffusers, registers, and exhaust hoods.